Agnes Kimber was born in Townsville on 23 January 1911 the sixth child and the eldest daughter of nine children of Martha and Fred Kimber. The family lived in Clayton Street, Hermit Park where Agnes’s father tended the water well as part of his job of engineer with the Townsville City Council. She attended St Mary’s School, West End where she excelled at the piano and quickly turned to teaching. Although schooled in classical music by the nuns, she soon taught herself to play the popular music of the 1920s and set up her own dance band. She continued to teach and play for the next 60 years influencing generations of Townsville pianists with both her disciplined methods and her flair for playing and teaching popular music. Her dance band playing possessed a remarkable sense of unwavering steady rhythm. Townsville people enjoyed dancing to her music so much that her band played several nights per week,52 weeks a year. Most evenings were fundraisers for various sporting clubs and charities. Playing all through World War 2, she was thrilled when the American forces, stationed in Townsville, and living in Anderson Park, gave her popular music that was issued to the troops by the American army. In this way she felt she kept up with the latest music. It was through the dances that she met her husband Bill Turner, who became a peerless Master of Ceremonies. For many years she played dances in support of the Royals Amateur Cycle Club, and she and her husband became great cycling fans. Mr Turner passed away in 1975. 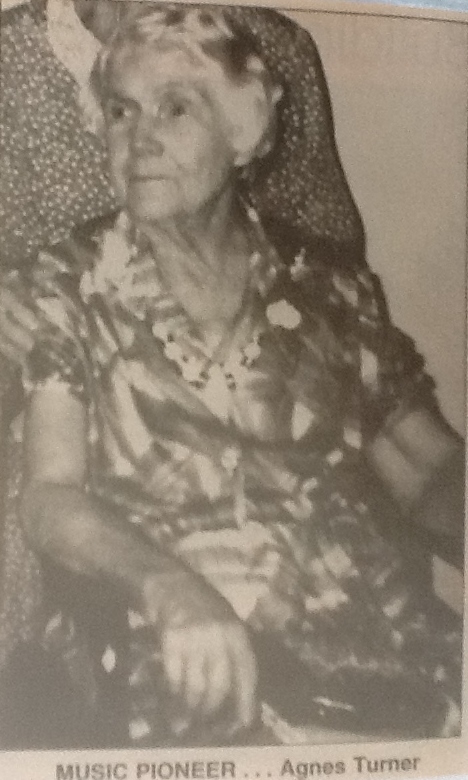 Agnes, who lived in the Good Shepherd Nursing home from 1994, passed away on 15 April 2004.